Puppet meets Alika’s fingers in a practice session. Watching the first year students at the Institut International de la Marionnette practice their repetitions is a fascinating experience. I can’t imagine many (if any) puppet teachers in the USA going through the kind of discipline and rigor that les élèves do. In a way it almost becomes a form of dance. Body movement is held in the highest regard. Brice Coupey, a renown artistic hand puppeteer works with the Guignol style puppet. In my interview later it was obvious that he saw Guignol as an astounding creation, though he himself never went to Guignol shows as a child. His parents put much more emphasis on sports. Which is a curious thing to think about as we watched the exercises. And they were exercises. One of the repetitions consisted of holding the puppet up high and then slowly turning it. Brice would do this until the students were visibly worn out from holding there arms up over their heads. And just when they began to groan he would the return his hand around using a different set of muscles. Then they would truly begin to moan. But holding the puppet over the head like this serves a real purpose. In a real show you have to do exactly that for sometimes an hour. Not always up but often enough to feel it. And what he was doing was getting them ready for the difficulties of performance. There is no groaning during a show. How long can you hold your hands up? Marina, Adriá, Coralie and Rose. 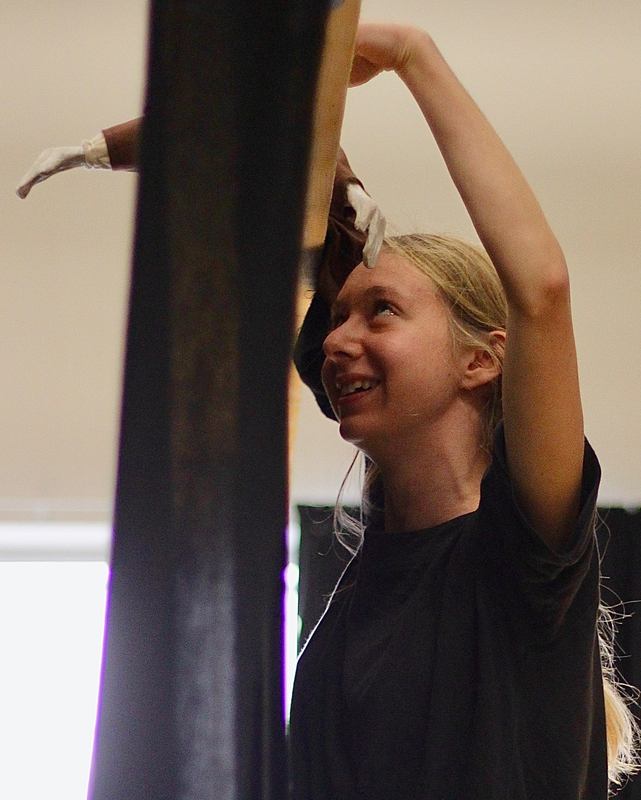 Another exercise had each student hold the marionnette a gain (glove puppet) aloft while five or six of them walked in and out of each other in a more cramped space behind the castelet (the puppet stage). They would do this for five to ten minutes arms up… and not bumping into each other. Quiet a feat. Emma Fisher, the Irish puppeteer and I got to watch as they also played various theatre games. Some games were played at the beginning to limber up. The rules of some of these games were frankly a bit of a mystery to me. Some I understood as I continued to observe them, a game where half the puppeteers would stand behind the castelet and choose a leader, while the other half would watch their movements and try to guess which one was the leader. Camille works with the Yellow Guy. A stranger game consisted of everyone, about 15 students, standing in a circle and passing around a series of rapid comical bowing to words like ‘hi’ and ‘heeya’ and then suddenly someone would say something random like ‘samba’ and everyone would start shimmying around while vocalizing a funny tune together. That almost made sense. But then a girl said ‘James Bond’ and the girls on either side of him would act like fawning devotees. It was funny, but certainly left me scratching my head. When it came time for les élèves to take turns doing little solo performances then the transformations occurred. Why were these students wanting to become marionnettistes (the French word for any kind of puppeteer not just those with strings)? There were girls who were obviously a bit comical and theatrical, for instance Czech Tereza or Manon. (And the ratio of girls to boys was quite high.) But then there were quieter ones like Camille, Coralie, or Alika, who emerged from their shells to be completely and wonderfully odd, even a little edgy. Or Marina, the normally serious Russian, who not only proved to have a slyly comic style, but also revealed a fantastic singing voice, almost by accident. And I realized that this little school to train marionnettistes must have had some peculiarly intriguing characters over the years. Meanwhile Emma and I were given a chance to make presentations to the first year students. Emma showed a short documentary that had been made about her doctoral project, Pupa. It revealed to me just how complex her thinking on the subject of puppetry and disability is. And no, she’s not seeing puppetry merely as a therapeutic device. 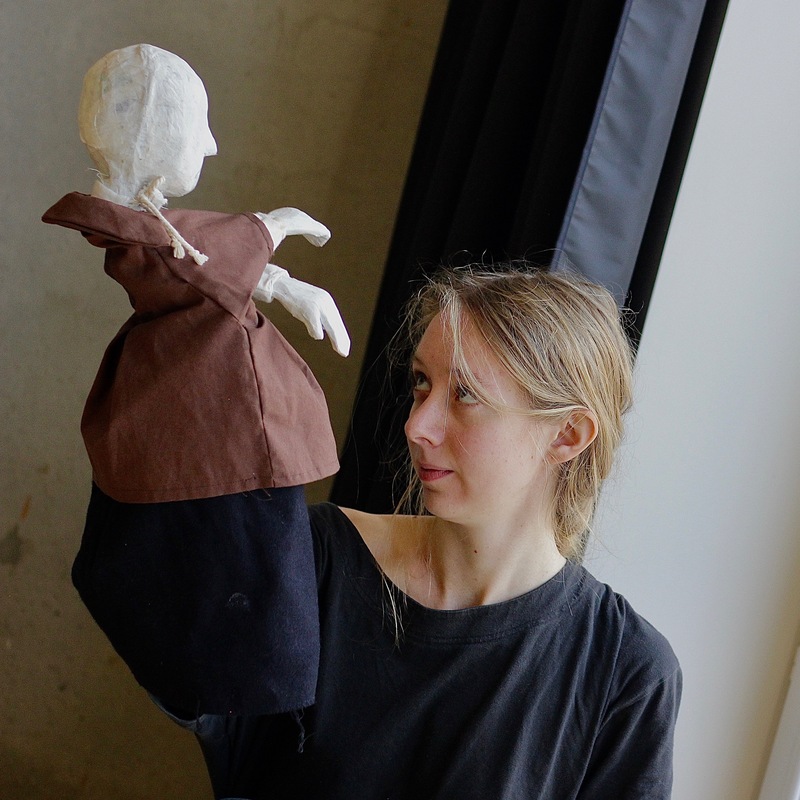 Puppetry for her is a way to tell stories that we might otherwise not hear. And especially told in a manner that is directly related to the disability in question. And she had a bit of an epiphany at one point that broken or incomplete puppets could be an excellent way of convey ideas that perfectly made puppets never could. Coralie and Red Friend on the floor. I, on the other hand, showed the students a short art film that I had been working on for years. They immediately let me know everything that was wrong at first. (Fortunately these European students don’t have that doctrinaire attitude of compliments before criticism. Which I’ve often seen as false.) But interestingly enough they then spent quite a while pleasantly trying to figure out what it was about. I took note of their best suggestions and decided go back and re-edit the film a bit. Since they were in many ways an ideal audience their ideas carried weight with me. Even though I knew I needed to retool the film I was heartened that they found many points to discuss, which is all I really ask out of anything I do. One person I had remembered good discussions with last year was Coraline Charnet. I hadn’t come across her yet. But soon that would be rectified. On a quiet Monday afternoon we hunted down a café in the rain. It was easy to renew our acquaintance and talk about issues of texture and life at ESNAM again. Coraline is thoughtful and committed to trying to understand how to live. Sometimes too much so. I appreciated her honesty and integrity. With regard to certain obstructions I reminded her of the wisdom of picking one’s battles wisely. An excellent conversation overall. Emma Fisher, researcher from Ireland, and Nathalie Elain, ‘Coordinatrice des études’ at Institut International de la Marionnette. I had another reason for being here. I had hopes of finding support for my documentary Gravity From Above. (You know the thing that this whole site is dedicated to.) I had a pleasant lunch with Raphaèle and the new director Philippe Sidre. And without going into any details I’ll say this. Yes there is some support there, not quite what I was hoping for, but enough. But I am quite grateful for what is there. But it turns out a have a longer way to go and more funds to seek. When I go to Prague I will be investigating more avenues. And in Tbilisi as well. But the good thing is that, as a result of good prompting from Raphaèle I now had a very detailed budget of my expenses over the years and a detailed catalogue of my many hours, over 30 (!) of interviews. (Getting them transcribed will be another expense.) There are other things I realized about what this project will need. But I will save that for another essay down the road. Meanwhile I feel good about things, even if this does raise new questions. But I am quite satisfied that Philippe, Raphaèle and the Institute are behind me in various important ways. Tereza’s Puppets. Švankmajer would be proud. Finally my time here at Charleville was winding down. Emma left before my last week and was not replaced by a new chercheur, though an American was supposed to come. They were setting up the Noël Marché in the Place Ducale, but it wasn’t quite ready when I left. The scent of freshly cut Christmas trees did waft through my olfactory glands. It was at last time to make my rounds to say farewell to Aurelie, Delphine, Raphaèle and Brigitte. To say farewell to Emily, and the other students staying at the Villa: Sayeh, Valentin, Manon, Adria, Camille, Rose, Raquel and Tereza, who gave me an impromptu performance with her puppets made from the remnants of real fox and ferret stoles, while explaining how she cut the furs and sewed them back together and told me adamantly to ask the other Czechs I would meet in Prague why she was the first Czech student, and why weren’t Czechs coming to perform at the International Puppet Festival next year. Raquel, Tereza, Manon, Adriá, Camille and Rose on my last evening in Charleville. In the morning I arose early, vacated my apartment, said farewell to Charleville-Mézières once again while musing what an important place this has been in my life. Now all I had to do was to find the SNCF TER train to the TGV in Champagne-Ardennes and get myself up to Northern Germany. But I knew I wasn’t done with the Institut International de la Marionnette yet. I would be back again. Part One of this visit to Charleville here. Earlier visits to the International Institute of Puppetry below.